Here's a very delicious shrimp and brown rice recipe that is also full of goodness! This is an informal variation that brown rice lovers in Montreal came up with. It is fast and requires no particular expertise. Mix 1 1/2 cups of brown rice with 3 cups cold water. Bring to boil and immediately cover and turn to lowest heat setting. Leave for 40-45 minutes. When done, add rice vinegar and stir. Transfer to a colander to cool quickly. Chop shrimp into half inch pieces and add desired amount of mayo. 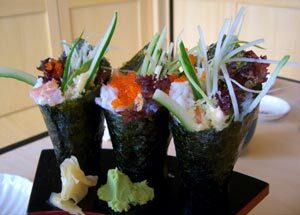 The most important part of Temakizushi, or hand rolls, is to make sure not to overstuff them with rice. We find that 4-6 tablespoons is plenty. 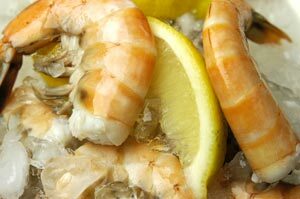 Add your shrimp mix and any combination of other ingredients to taste. Season with wasabi, ginger and soya sauce. Place a half sheet of nori horizontally on your mat and put some rice on the left side of the nori, but make sure to leave a border of nori all around. Next put your ingredients vertically across the middle of the rice. Take a corner of the nori and tuck it into the middle of the nori, about 1/3 of the way down from the top, and continue rolling. You can also wet the nori just a little bit to help it stick together at the bottom of the cone. Try different combinations and you'll see how amazing these cones can be. Go wild and enjoy!